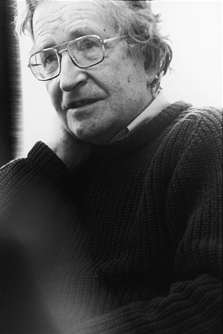 I’ve been reading Noam Chomsky‘s Understanding Power, and it’s really been taking me back to my radical leftist mode. Having shifted to the right in many respects over the last year (or, to put it more precisely, towards the center), I don’t immediately accept everything he says. People on the far left can cherry pick as well as anyone else to paint a picture of power-serving institutions, and deserve as much scrutiny as anyone else (although you might be led to believe that this scrutiny is a symptom of your indoctrination). I’ve realized that we disagree somewhat on Israel (he doesn’t seem to be interested in history before 1946 or so, whereas I think the pre-1946 period is highly relevant), and we have vast disagreements regarding epistemology (he thinks that direct personal experience trumps academic knowledge, whereas I’m more skeptical of direct experience as the primary source of knowledge, given the heuristics and biases that color human thinking, although he makes good points about how academic knowledge deserves more criticism than it is given, especially regarding the connection between methods and conclusions, especially in the social sciences). Anyway, he’s been talking for quite a while about education, and the ways in which K-12 and higher education indoctrinate, train, and filter our youth (indoctrinate them into the mainstream beliefs, train them to take orders and follow the rules, and filter out those who are unable to conform). This is an area in which Noam and I largely agree. I’ve been critical of our education system since I was 16 or so, when I would refuse to take classes to “look good for college” but instead chose to sign up for things like music theory at my local community college in the evenings, and take US History over the summer (also at community college) to free up room in my schedule (always packed from A period through after-school classes) for graphic design classes. So I’ve been critical (once I even started a silly and short-lived club, “The Walk of Giants” to promote student-driven inquiry and resisting the pressure to strive for grades over personal enrichment). I discovered the writings of John Taylor-Gatto in 11th grade (courtesy of a friend, Doug Goddard), and mostly fell in line with what he had to say. I agree that most of schooling actually teaches children how not to think, or to think only along narrow channels that do, on balance, more harm than good. One of my furthest dreams is to use my (anticipated, wistfully) wealth to start a school run according to progressive pedagogy encouraging free and nonconformist thinking, while at the same time giving students the tools to navigate and overcome the structures of society. So Noam and I are friends here. But I’ve started to wonder: what would happen if we got rid of public education? It’s a thought experiment I’ve never undertaken, despite all the criticisms of the status quo. I wonder… let’s give it a shot. Note: I’m thinking this through as I’m writing it, so I have as much idea of where this is going as you do at this point. First, let’s set parameters. I’m going to assert (perhaps I’m being overly bold) that literacy and basic math skills are crucial to a functioning society (although I’ll acknowledge that the term “functioning society” could be criticized as a society in which current power structures are maintained, and therefore is a flawed goal to strive for). Actually, you know what, I won’t assert it. In this experiment, literacy and math skills aren’t crucial (in the sense that we need to have public education for them). If kids pick them up, great, if not, too bad. I was going to say that we preserve public education through 5th grade (for basic math and literacy), but now I won’t. All public education, from K on up, is out. Where does that leave us? Private schools will still operate, and children born into families with money (and, of course, the desire to send their children to these schools) will go to them, and receive much the same education they do today. And everyone else? This is where it gets interesting, because now so much depends on the child’s personal level of curiosity, as well as their family circumstances. I’ll also assert (thought experiments are fun, since you can just assert parameters) that some of the funds used to fund the public education system have been diverted to expand public libraries into general learning centers, with staff on-hand to work with children and help them answer their questions. So the resources of the public schools have been preserved. Only the requirements that students attend has been taken away. Children are now free to do whatever they like (or more specifically, what their parents/guardians tell them), basically from birth onwards. Incidentally, I suppose we should do away with child labor laws then, since the end of mandatory education removes some of the reason to keep those laws–if kids want to be making money, that’s their prerogative. Ok, so kids. There are a few categories I’ll divide them into to help think this through. Now, the A kids are in pretty good shape. Their parents will push them to learn, and they’ll have the necessary support (through the above-mentioned learning centers) to direct their education. It’s unclear how much of a role the parents will be able to play, given their work requirements–possibly the parents can take charge of the education and more or less home school the child, or perhaps their work requirements will force them to offload much of the responsibility onto the learning center staff. In either case, the kids will learn. In fact, it seems like these kids will be better off than they would be in public schooling, given the critiques of public schooling outlined at the start of this post. They’ll be self-directed, able to guide their learning according to their interests, and construct their schedule as they want it. These kids will do fine (although it will be interested to see how they stack up to the private school kids once they begin supporting themselves (I’m intentionally using “support themselves” over “working,” since “supporting yourself” is a universal requirement for human adults, while “working” is only a small subset of all the possible ways to support oneself, and there’s a good chance the A kids will find another way. The B kids will probably make it out OK as well. In their case, however, a lot more will hinge on the parent’s ability to be involved in their education, since these kids won’t be inclined to pursue their education themselves, at least not at first. If you’re of the opinion that all children are naturally curious, and just need to have it brought out of them, then perhaps you think that all B kids can become A kids with a little bit of encouragement, and so won’t concern yourselves with this category overmuch. On the other hand, if you think that some kids just are just duller than others (which, given that people come in a variety of shapes and sizes, is unfortunately not an unreasonable belief–after all, some people are taller than others), then this category will matter. The parents will have to push the child, since the normal structure of coercion of the public school won’t be there, and the learning center staff aren’t set up for this. If the parents have the time and energy, their child will come out just fine. If not, however, due to taxing work requirements, then these kids might flounder. On the plus side, they might find other strengths in the non-academic realm that they might not have discovered had they been forced through the school system, so in the end they might come out quite well as well. The question to ask yourselves is how much “schooling” these kids need–will they be able to make it without being able to read or write, or do addition? Maybe yes, maybe no. The C kids will be fine, probably a bit above the B kids (as far as academics go), but not quite as well as the A kids. These kids will probably spend most of their time at the learning center, just like the A kids, but they’ll lack the support and encouragement at home. They’ll run the higher risk of getting distracted from school, getting caught up with social life, and losing focus. On the other hand, there’s a chance these kids will become real innovators, as they won’t be getting the advice from their parents (the past generation), and will thus be forced to figure things out for themselves. Of course, this is all assuming that they’re given time to learn. It’s likely that a large majority of these kids, given their families, will be forced to work from an early age, or to be involved in some other activity that prevents them from getting an education. This isn’t necessarily a bad thing–a curious kid learning a trade from a young age could do quite well–but it also could be a tragedy. It’s worth noting that preventing this outcome (kids being forced to work instead of getting an education) is one of the reasons mandatory public schooling was set up, at least in my understanding. The D kids are in a tougher spot. Without internal curiosity or family encouragement, these kids won’t have any reason to go to the learning centers, or to learn anything, really. They’ll spend their days doing whatever it is they’re doing–working, playing, fooling around–and will most likely have to just find their way through life without the benefits of any education. Now, the assumption in my mind, and perhaps in many of yours, is that these kids will end up pretty miserable, but that’s not necessarily true. They might do an excellent job at life-making and find themselves quite happy somewhere doing something non-academic. There’s no law saying you need an education to succeed–it’s just one of the core assumptions of our society (albeit I think a reasonable one). So that’s how I imagine the abolishing of mandatory public education might play out, at least as far as individuals are concerned. What about for society? An interesting question in its own right What would happen if, all of a sudden, everyone had a wildly different educational experience? Where there was no guarantee that any particular person knew X, Y, or Z? Some kids wouldn’t know math, others wouldn’t know US History, while some would be experts in chemistry or masterful painters. Well… that’s kind of like society today, when you think about it. The literacy rate would probably be a little lower, but other than that, things might not change so much. Also, people wouldn’t have been filtered and labeled based on their ability to succeed within the education system, so it would be much harder to evaluate people. Or rather, you would have to evaluate them on other criteria… like perhaps the merit of their actions, skills, or ideas. That would be very difficult, though, and would probably lead to large shifts in how hiring works, and by extension how businesses work, and by extension how the economy works. Something worth exploring at a later time, perhaps, although I have a feeling this will be much more challenging than this current exercise. Society wouldn’t collapse, I don’t think, nor do I expect there would there be famines. That’s comforting, at least. I think this brings us to the end of the thought experiment. To be honest, I’m a bit surprised with the outcome. I expected the negative outcomes to be far greater, and the positive outcomes to be far fewer, than what seems to have come up in my simple formulation. That said, I’ve written this out over 90 minutes while waiting for a train to Allahabad, so there are probably countless factors I’ve failed to consider, and most likely several flaws in my reasoning. I am not advocating we abolish the public education system, not even close. I have no idea what the effects would be–this flawed little experiment barely scratches the surface. But it’s worth thinking about, I suppose.